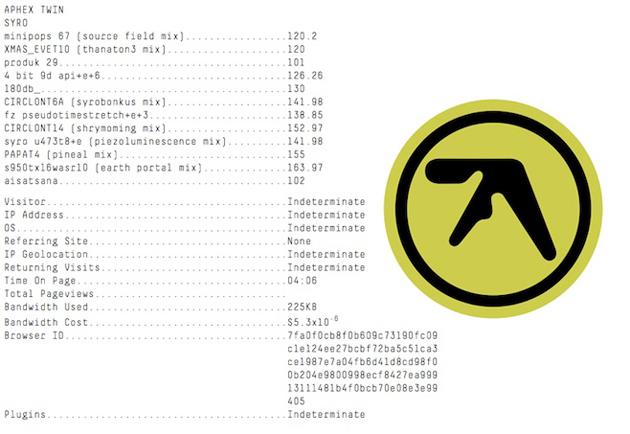 Fans have been waiting for a new Aphex Twin (aka Richard James) album ever since 2001's Drukqs. Well, he finally put out the first details of this follow-up today -- and in a very modern (if characteristically cryptic) fashion. The electronic musician revealed both the title and track listing through a Tor web link, which requires the kind of privacy-minded "secret web" browsers used by NSA whistleblowers and black market dealers. In fact, trying to visit the public version of the site gives you seemingly everything but what you're looking for; all you'll see is your own internet connection details and James' signature "A" logo. It's almost an anti-publicity campaign, in that sense. You can look at the image below if you're willing to spoil the surprise, but be sure to check out Aphex Twin's excellent/disturbing "Windowlicker" video (the music starts around 3:50) while you're at it.